If you have waste, junk or rubbish cluttering up your home then why not let us take care of it for you? 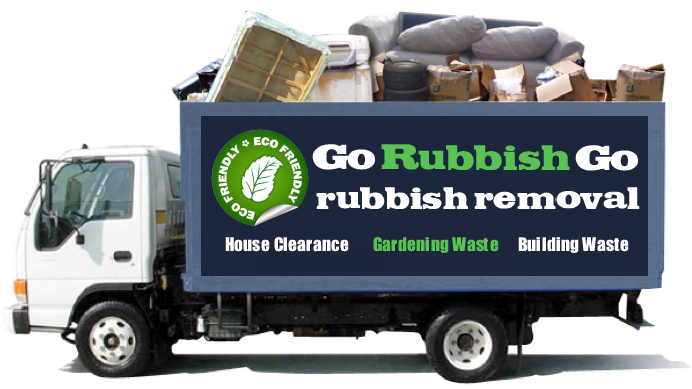 Go Rubbish Go offers a range of professional Bickley rubbish removal services. We’ll come to your property and perform a thorough and complete rubbish clearance and disposal so that you can make the most of your garage, attic, office or garden! Hiring us means you won’t need to waste your free time, and you won’t need to rent a van or a skip to get rid of your rubbish. When it comes to waste disposal BR1 we’re the best in the Bickley, so make your booking with us today! Call and reserve your appointment now on 020 8610 9182! Your rubbish removal doesn’t need to be expensive, and if you’re worried about the cost then our company is here to help! Every BR1 waste clearance service that we have to offer is cheap and affordable, with budget-friendly and competitive rates to suit every pocket. We’re confident that you won’t find better value for money anywhere else in the BR1 or BR2 areas, so why not see how much you can save today? Contact our experts now and get a free price quote with no obligation necessary and see for yourself. Book now by giving us a call on 020 8610 9182! 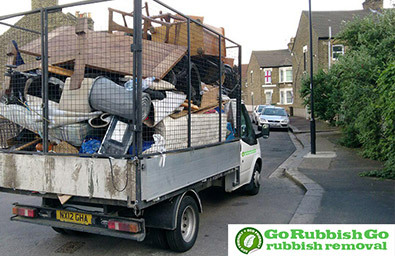 Go Rubbish Go is one of the most popular rubbish removal companies in the BR1 and it’s all thanks to our commitment to providing the best services. By choosing us for your rubbish disposal Bickley you can take advantage of our many perks and offers, including our money-back guarantee, speedy services, 100% customer satisfaction and our amazing attention to detail! With years of experience and talented fully-vetted specialists we make the perfect choice for clearing your home or office. Act now and book today by calling a team member on 020 8610 9182 – for services that won’t let you down! 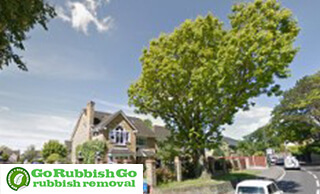 I was worried that I couldn’t afford a rubbish removal service in Bickley BR1 after having renovations made to my home. The builders had left such a mess and I didn’t have the time to get rid of it myself. I found this company online and booked with them after seeing their good reviews. The staff were friendly and helpful and got to work without any issues. 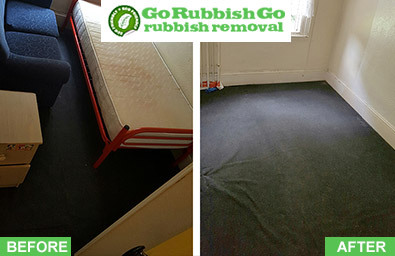 The job was done much sooner than expected and there wasn’t any rubbish left behind. A lot was recycled too so very good value for such a low price! Whether you need an emergency waste removal in Bickley on the same day you call us, or whether you need a weekend service, our company is incredibly flexible when it comes to bookings and appointments! If you hire us you won’t need to change your hectic schedule to fit us in – all you need to do is give us a call and book your rubbish clearance in Bickley, BR1 whenever you need it! Our experts are ready and waiting to help you clear your office, home or garden, and if you live in the BR1 area then we’re just a phone-call away! Pick up the phone and hire your fast and flexible service now! Book Our Waste Clearance In Bickley And Enjoy An Eco-Friendly Disposal! If you care about the planet then our Bickley waste collection company is just what you need! We provide excellent waste disposal services that are as environmentally-friendly as possible, recycling any goods that we can and disposing of the rest in safe and ethical ways. Unlike other companies we don’t cut corners when it comes to giving you greener services, and we even watch our carbon emissions with our fuel efficient vans. 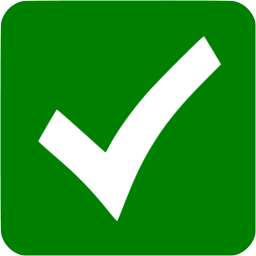 If you want to make sure your clearance job is as environmentally-friendly as can be then speak to a team member now. Call and book to avoid disappointment on 020 8610 9182! Bickley is a part of the London Borough of Bromley and bears the BR1 and BR2 postcodes. Found ten miles away from Charing Cross, Bickley is well-known for its affluence and large, expensive homes. It’s one of the richest areas in the whole of England. Bickey is home to a number of parks and open spaces, including the popular Jubilee Country Park, which is over 60 acres in size and has lots of natural woodland and beautiful sights. With its many schools and its other parks and recreational grounds including play areas such as Whitehall Recreation Ground, it’s easy to see why Bickley is a popular place for families. Travelling around Bickley is fast thanks to Bickley station.